The Nailed It cafe is officially open for business. In the heat of the summer, we don't want you melting away, so dip your fingers into our delicious menu. Tonight's menu features Les Desserts d'Antoinette from Lime Crime. As you can see, we've imported some of this season's most scrumptious treats from Miss Antoinette's table straight to our cafe's treat case. We've prepared these tasty teaser shots to incite the salivation flood on your tongue. Now that we have whet your appetite, as your humble maître d', let me guide you through our first dessert selection. Our first option is Parfait Day. A soothing parfait on a hot day will surely cool you down, but also bring warmth and comfort to hungry tummies on cold, rainy days. Everybody loves parfait! Don't miss out on the ripe picking of the season, Peaches ♥ Cream. If a juicy peach isn't enough to pucker those lips, then top it with a huge dollop of lightly whipped cream. Resistance is futile. The summer menu peaks with this next goodie, Crema De Limón. A sour tickle on the tip of your tongue both refreshes and excites, but the cream finish levels each bite perfectly. Difficult to sell, but impossible to resist is Pastelchio. Subtle flavor, sophisticated taste. Once In a Blue Mousse look like the sky and feels like the clouds. You'll float through each bite into euphoric exaltation. 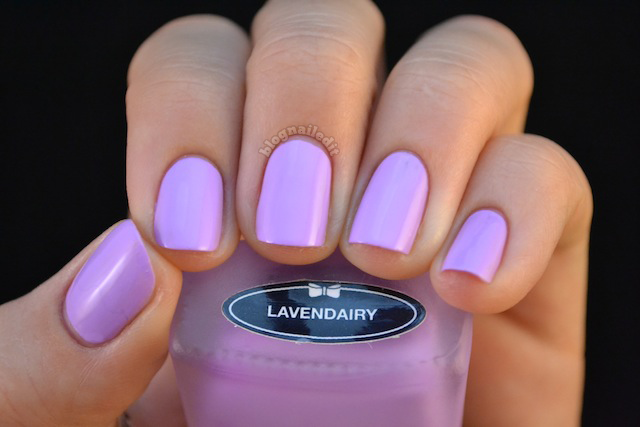 Floral scents dance across your palette when you dip into Lavendairy, but the taste is unmistakeably delicious. All good things must come to an end, but ending in the creamy, sweet Milky Ways won't leave you wanting more, it will leave you needing more. Do tell your friends to visit us sometime. Our delicacy's our unrivaled! Are you drooling yet? I haven't stopped since I opened up the package I received from Lime Crime yesterday. I literally have nothing bad to say about these polishes. I had personally never heard of Lime Crime before, but I'm thrilled I now know. 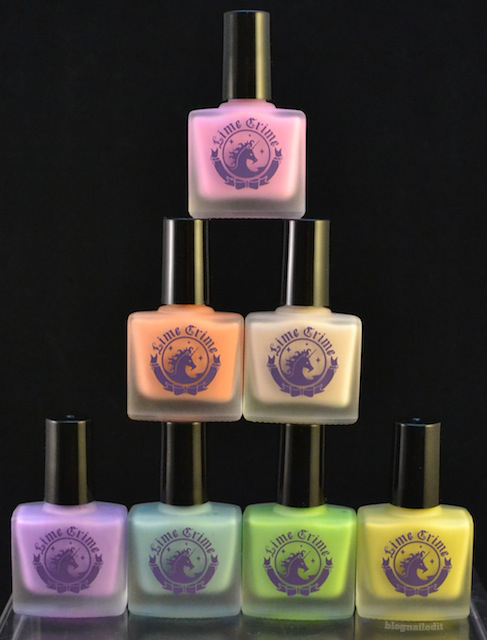 They specialize in makeup products, but on June 20th of this year, they dipped into the world of nail polish, and I have a feeling that once word gets out, they'll be scrambling to keep up with the demand for these colors. Seriously...grab them while you can! 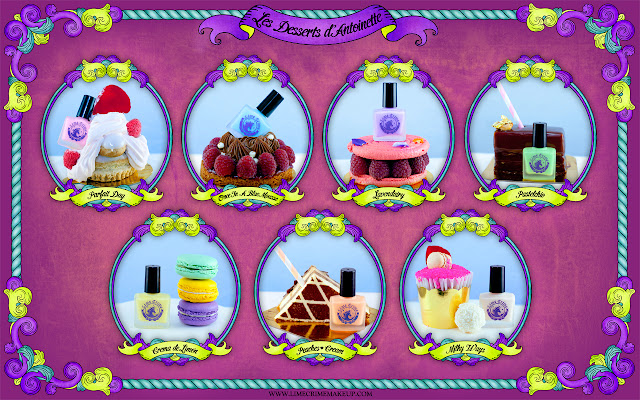 Every single color from Les Desserts d'Antoinette, the collection featured here, is absolutely stunning. These bright pastels are decidedly easy to apply, and after two effortless coats, you get the opacity you see above. I applied a third coat to Milky Ways, Crema De Limón and Peaches ♥ Cream to ensure the pictures were looking their best. It's damn near impossible to find creme finishes in pastels that make such a bright yet soft impact, but Lime Crime nailed it! Like I said, you won't here a bad thing from me about these polishes. I've been wearing a few layers of these colors for a day now, using the sometimes problematic Seche Vite as the top coat, and there's no damage. None. And I lifted weights today. 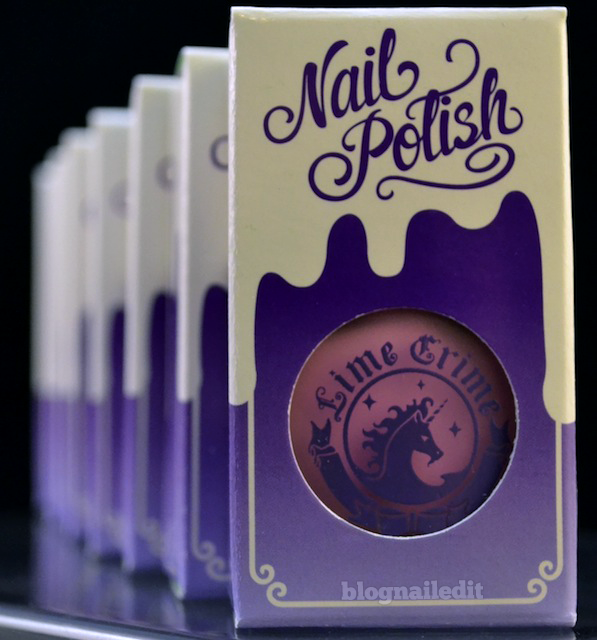 I also have to rave about the packaging and advertising Lime Crime has for the line. The first picture is lifted straight off of their site (available as a background in several resolutions here) and is what inspired me to give you a menu to drool over rather than some hum-drum swatch info I normally deliver. You can also see that each polish comes in it's own, perfectly sized box, with the color's name on top and the bottle peaking through a punch out in the front. My inner hoarder hates the idea of throwing these away yet. I loved the packaging so much, it inspired the dripping color design seen in the first picture and below. The application was aided by the brush's design. It's the perfect size for what it is. These cuties are only 0.3 oz (sadly), so they're squatty when sitting next to most of the other bottles in my collection. I prefer that though, as it seems the brush will reach the polish longer. That's a huge relief because I'll cry the day these run out. 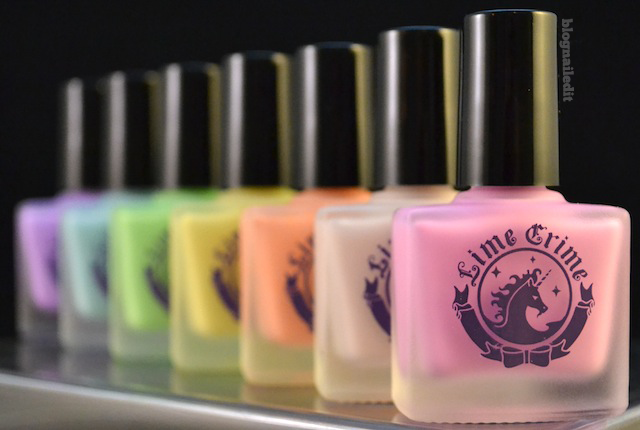 You can pick up all seven of these polishes individually for $5.99 each at Lime Crime's website, or as a set for $39.99. These products were sent to me by Lime Crime. The reviews are based entirely on my experience with the products and were in no way influenced by anyone. Wow I love all of this! The colours, your design.. everything! These are all beautiful! I really like the design you did too. Love them! And your design reminds me of Dr. Seuss illustrations.. double win! Wow, amazing polishes, one is better then the other. 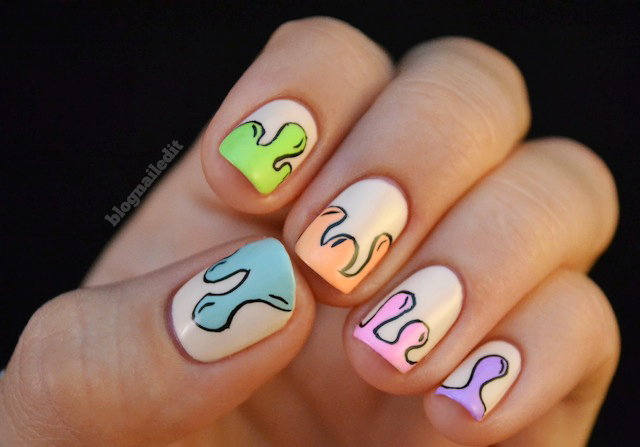 Love the pastel colors, and your nail design is quit special! I love them all, they're the prettiest pastels I've ever seen! I love dripping nail designs - I did that for Halloween last year and it was so much fun! This is just super pretty though! These pastels look VERY saturated. I am not a fan of LimeCrime's makeup for a variety of reasons so I haven't checked out their products in a while, but I'd like to try these after seeing your swatches. They'd make amazing skittles! Try ebay. I just order the peach cream color. I just fell in love with your nails which is the reason why I know I need to get it! Please let us know where else can we get it for those who are outside of US. Thank youuuu! 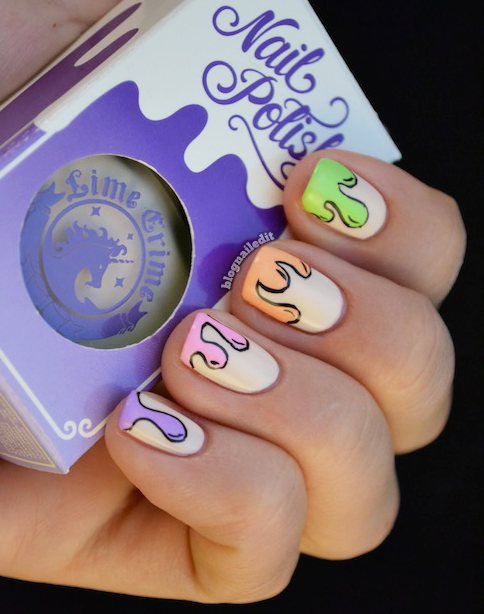 Ohh those polishes are gorgeous and your nail art is fab! Milky Way is GORGEOUS! I've never heard of this brand before, but I'm intrigued. They don't look streaky at all, which is what I find many lighter colored polishes do. omg I think I fell in love! These look absolutely amazing...gah! I'm not supposed to buy any nail polish but these look so awesome! I LOOOOVE Lime Crime! So excited to see your reveiw this morning! I have been anxiously awaiting this release, everything they put out is amazing & Doe Deere is my Fashion & Beauty IDOL! LOVE! How did you do the drips? Did you freehand them and then outline with a striping brush? I almost never love nail art, but I love this design! I just got an empty striping brush, and dipped that into each of the colors to create the dripping design. Then, I grabbed my trusty Color Madric nail art brush (it's literally just called Black) and carefully outlined the drips. I actually made the shine marks on the drips first, and didn't like the way it looked without an outline, so that's what made me decide to give it a black outline. If you're having trouble with the striping brush, consider a Sharpie. You'll have to wait a long time for the drips to actually dry, and I'd suggest adding a topcoat before you attempt to draw with the Sharpie, but it'll work similarly and give you more control if you're not used to stripers. Hah! I was thinking that maybe I could use a Sharpie! I actually draw a lot of Dr. Seuss pictures for my son using a Sharpie, and as someone said above, it's kind of reminiscent of his work. These are so awesome - I really want to get some! Are any of them dupes for any existing polishes? What's the finish like? They look semi-matte in the pictures which is quite interesting for pastels. I personally don't know of any dupes, but Leslie at Polish Art Addiction did a review of them and compared them to some existing colors she had. Check that out here. These are GORGEOUS! I'm in love with milky ways! I love the drip design, very Dr. Seuss!